Should I Dress My Pet for Halloween? Just like people, some pets like to dress up in clothing and hats. Most animals prefer you don't make them wear human outfits. Out of respect for your pets' feelings and well-being, it's key you honor their wishes whether or not you agree with them. As much as I want to dress my dog Bodhi up in a Halloween costume, he wants nothing to do with hats and human outfits. He becomes stressed and anxious when I try to outfit him. The most he's willing to tolerate are accouterments that go around his neck like bandanas, necklaces, and bows. 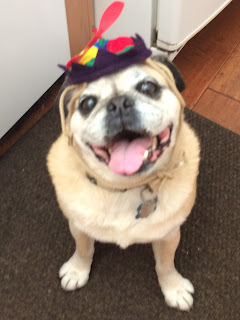 My previous dog, Kobe Bear, loved wearing hats and necklaces. He happily wore them for hours. Not my Bodhi! He clearly tells me that costumes aren't his thing by throwing hats off his head or sitting down when I put a vest on him. Whether I like or not, I respect Bodhi's wishes, and I refrain from dressing him up. Wearing human outfits is not his thing. The last thing I want to do is stress him out or make him uncomfortable. So I have let go of my wish to put costumes and hats on him. You should only put a costume on your pet if they are comfortable with the idea. Even if your pet doesn't mind wearing outfits, be mindful of stress signals that your pet might be giving you like yawning, lip licking, turning their back to you, or avoiding eye contact. Some pets will run away and hide if they're not on board with your playing dress up with them. If your animal exhibits any of these "stress signals," take the outfit off immediately as it's not fair to your pet to keep them dressed. Many pets tolerate wearing clothing to make their people happy. That's why it's key to keep a lookout for signs of stress or anxiety when your pet is wearing a costume. If your pet doesn't like wearing a costume that covers his head and body, a better alternative might be a bandana or bow. Or nothing at all. Costumes must provide freedom of movement for your pet's comfort and safety. When choosing a pet costume, make sure it doesn't impair your pet's hearing, sight, or the ability to bark, eat, drink, or eliminate. Your pet's head and neck should be able to move freely in their outfit. If your pet is wearing a hat, double-check that isn't too big and doesn't cover her eyes. Avoid potential Choking Hazards on costumes like bow ties, ribbons, hanging beads, or pieces that might fall off, along with other loose items which might cause choking if swallowed. Always watch for these kinds of objects and any other potential choking hazards on your pet's costumes. 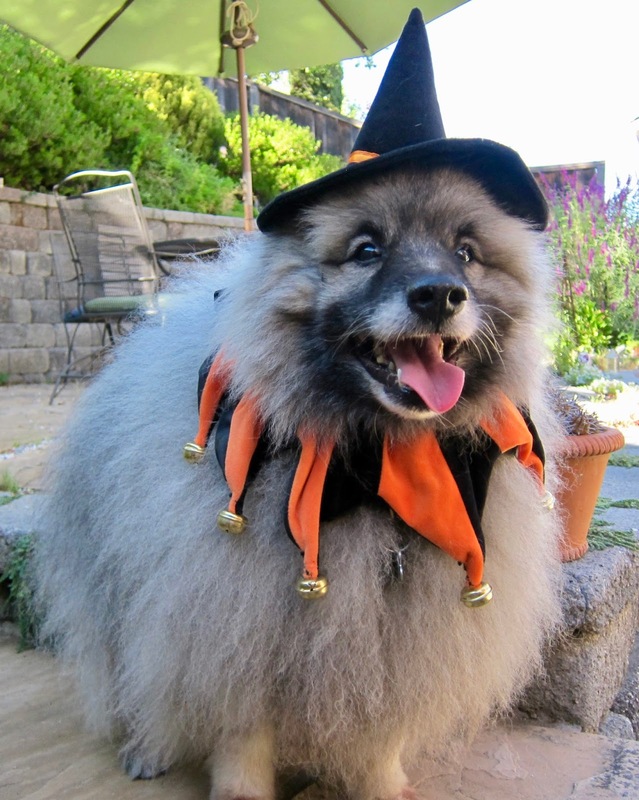 Allow your pet to get used to wearing his costume before going trick or treating on Halloween. Avoid itchy or uncomfortable materials. Choose a brightly colored costume so you can be seen at night, especially if you plan to take your pet Trick or Treating. Bright clothing makes it easier to see your pet in the dark. Attaching a blinking light and using reflective material will increase their visibility. If you use glow sticks and jewelry, keep in mind that they can be toxic to your pet if ingested. NEVER force your animal to wear clothing because most animals don't understand what human clothes are and why they need to wear them. If if you really need to put an outfit on an animal and your animal hates wearing costumes, a better choice might be dressing up a stuffed animal. 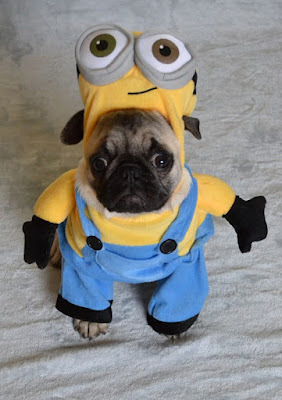 It's important your animals feel comfortable and safe wearing their Halloween costume. Otherwise, it's not worth upsetting them by making them do something that scares them. Halloween is one of the scariest and most dangerous days of the year for your pets. When humans transform themselves and their animals into unworldly beings like ghosts, Minions, Rocky, and Super Woman, it can be upsetting and disorienting for your pets. If you do nothing else this Halloween, make sure your pets are wearing their ID tags with your current cell number on it just in case your pet slips out when trick-or-treaters come to your door. Your pet's best chance of finding their way back to you if they ever go missing is by wearing identification tags and having a microchip. If you choose to dress up your pet, never leave them unattended while wearing their Halloween costume. Make sure your pet's costume fits properly and doesn't' encumber their movements or cover their face, eyes, ears, and nose. Halloween candy, especially sweet confections containing chocolate or xylitol (a sugar substitute used in sugar-free candies and gum) can be dangerous to your pet. It's best to avoid feeding candy to your pet. Make sure you put your Halloween goodies in a safe place where your pet can't get access to them. Keep jack-o-lanterns and lit candles away and out of reach of pets. Keep Glow sticks and jewelry away from pets. They can be toxic if ingested. This awful tasting liquid can make animals salivate excessively and exhibit odd behavior. 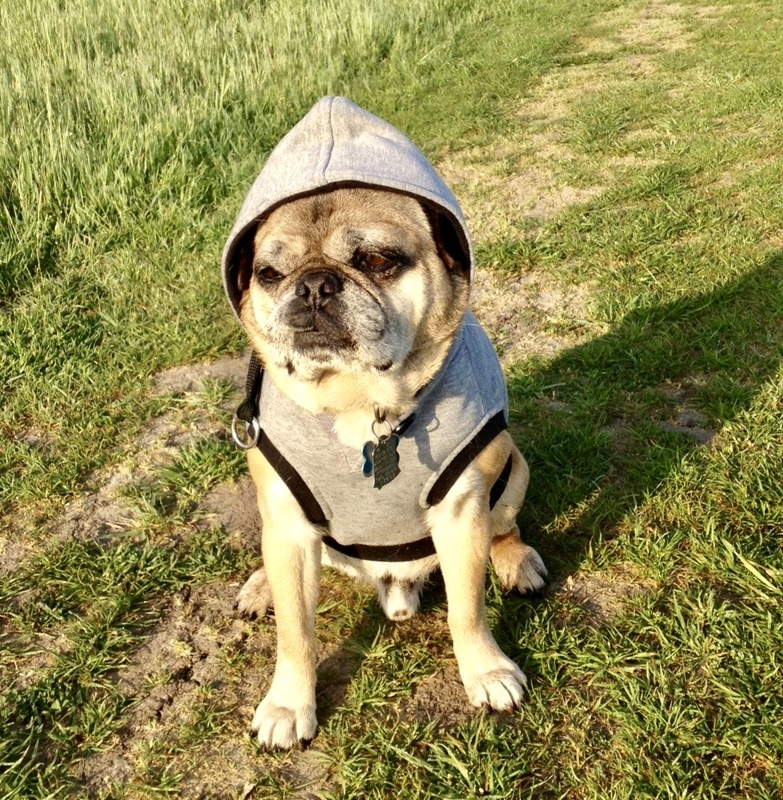 MacGuyver The Puggle dressed as "Rocky." Keep your pets in a quiet back room away from the front door where they can easily escape when tricker or treaters arrive. If your pet is nervous around strangers or tends to bite when stressed, they will feel safer in a room away from Halloween activity while the trick or treaters are out. Your dog will thank you for taking the stress off of them. Don't leave pets outside unattended during Halloween trick or treating. If left alone, your pet can get spooked and even escape. Plus some people can do cruel things to pets, especially black cats. If you are feeling stressed, then there's a good chance your animal family is also feeling stress. Animal Communication and Animal Reiki sessions are two ideal ways to reduce stress while promoting overall well-being for you and your pets. It's important you take care of yourself because your stress affects your animal family. Since stress is a primary cause of behavioral issues and illness in pets, helping yourself and your animal family to de-stress and relax can make a world of difference. Talking with your animal during an Animal Communication session is similar to talk therapy in that it's essential for you and your pets to express yourselves to release misunderstandings and miscommunications. Pets prefer to live in a calm, peaceful environment and welcome the chance to offer solutions to decrease the stress. 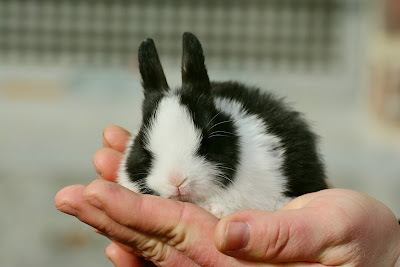 A 30-minute distant Reiki session for you and your animal family can reduce stress since Reiki promotes deep relaxation which fosters self-healing along with an overall sense of peace and well-being. One of the bonuses of distant Animal Communication and Reiki sessions is you, and your pets can receive their many benefits from the comfort of your home. Since stress affects all members of your family, Cathy prefers to include you and your entire animal family in your Animal Communication and Reiki sessions whenever possible because stress affects the whole family. There is no time like the present to give yourself and your animal family the gift of relaxation by de-stressing your lives with a 30-minute Animal Communication and/or distance Reiki session. Your pets will thank you for taking good care of yourself and them!